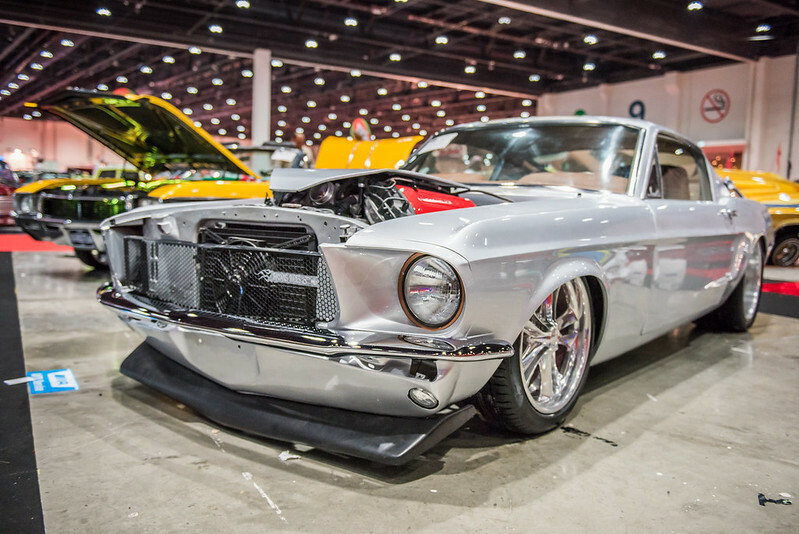 All roads lead to the capital this weekend as over 30,000 visitors will descend to a much anticipated fourth consecutive edition of Custom Show Emirates (CSE), held from 05 April – 07 April 2018 at ADNEC, Abu Dhabi, UAE. 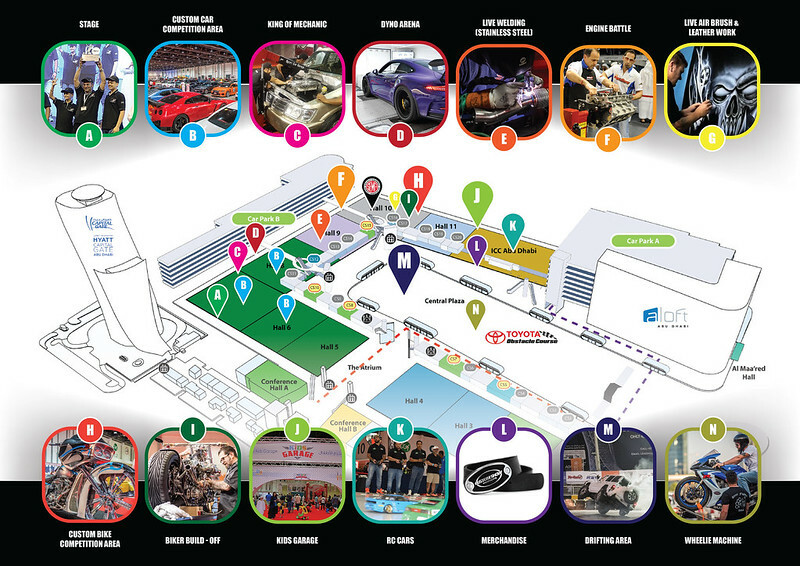 The show features 17 exciting onsite activities, including 4 brand new ones, which are: Toyota Obstacle Course, Live Stainless-Steel Welding (Exhausts), Live Leather Works & Airbrush Land. Roaring into action will be all the crowd favourites, including; 4×4 and Saloon Drifting, Stunt Driving, Custom Cars & Bikes Competition, Engines Battle, Bikers Build-Off, Dyno Zone, King of Mechanics, RC Arena, Wheelie Machine, Kids Garage and much more to keep the adrenaline pumping for the visitors. ‘’We are especially excited about 3 things this year; First, we have internationally acclaimed Airbrush & Pinstripe artist Danny SchrammWerk all the way from Germany for a special paint show. Second, SEMA USA pavilion will be open to public for the first time and third, we have a brand-new pavilion all the way from Motor Bike Expo Italy, which will showcase the most exotic custom bikes from all over Europe – its motoring euphoria!.’’– Nasser Taqi, Partner, Custom Events, UAE. Top executives from international partner events are flying in from all over world to attend the show, including; SEMA USA, Sand Sport Super Show USA, Nippon Auto Parts Aftermarket Committee (NAPAC) Japan, Tokyo Auto Salon and Motor Bike Expo (MBE) Italy. ‘’Motor Bike Expo is very excited to be participating at Custom Show Emirates 2018. This year, both of the head organizers, Paola Somma and Francesco Agnoletto, will be present to meet with companies and organizations, as well as with the public, to share the first announcements regarding the next edition of MBE. The Motor Bike Expo team is looking forward to continue developing their partnership with Custom Show Emirates and is eager to find new and exciting ways for these two events to collaborate for years to come.’’ – J. Harley Staniforth, Foreign Relations, Motor Bike Expo, Italy. The show has confirmed exhibitors from Italy, Switzerland, Australia, Russia, China, New Zealand, India, Japan and several GCC countries that will showcase the latest in auto customization products and services. ‘’Last year’s event was a massive success, in fact, we received so many orders that we ultimately decided to open our own showroom in UAE, under the brand name – ‘’Samurai Eagle’’. This year we are specially flying in 3 cars from Japan, which were displayed at Tokyo Auto Salon 2018 Tokyo and Osaka Auto Messe 2018, each a masterpiece in itself. Thanks to Custom Show Emirates, the UAE market is now our top priority’’ - Kuhl Racing, Managing Director, Takahiro Kataoka, Japan. Happening concurrently, the 3rd International Motorshow Abu Dhabi will be the platform for several manufacturers planning their regional launches. Apart from returning exhibitors such as; GMC, Subaru, Chevrolet, Nissan, Infinity and Renault, participating for the first time will be; Toyota, Lexus, Ford and Borgward as well. With its extensive line-up of international exhibitors and ‘action packed’ schedule of onsite activities, the event promises to give cars and bikes enthusiasts; an experience like never before. 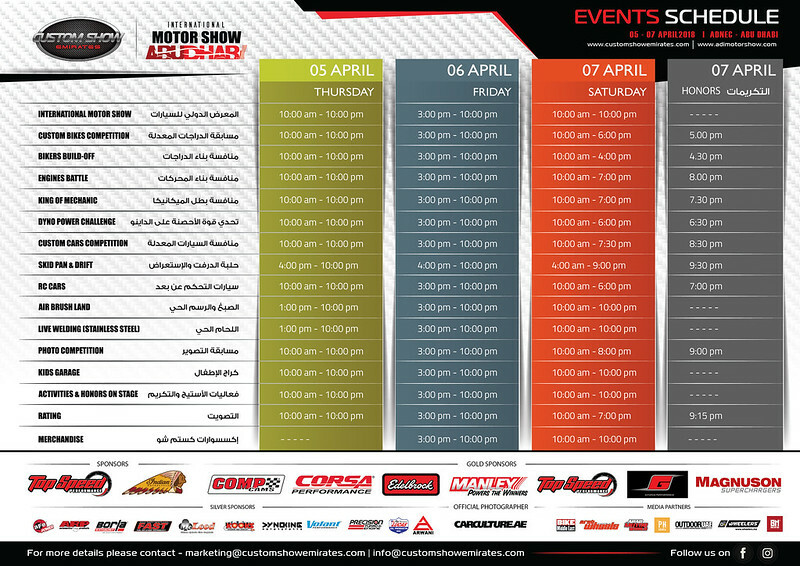 4th Custom Show Emirates & 3rd International Motorshow Abu Dhabi 2018 will run from 10 AM – 10 PM, 05 April – 07 Aril 2018 at ADNEC, Abu Dhabi, UAE.